Chalcedony jewellery set in sterling silver. Chalcedony is opaque and even in texture. It is usually dyed and can be bought in pastel shades although the blue chalcedony is natural. 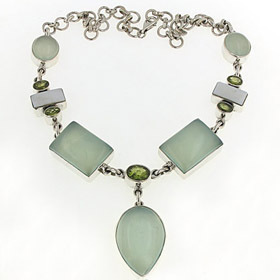 Chalcedony mixes perfectly with sterling silver. Our sterling silver bracelets make great co-ordinates.